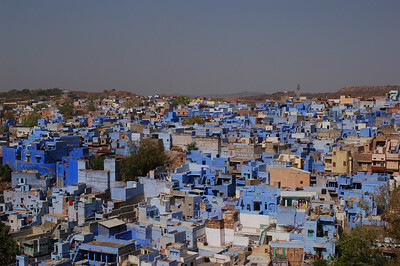 Jodhpur is a major tourist draw for two reasons 1- It has a giant fort, 2- It's blue! The absolutely enormous Meharangarh Fort sits right in the middle of the city perched on a hilltop, surrounded in by a maze of blue homes. The Brahmin-blue was once used to indicate the presence of inhabitants of the highest caste, strictly religious and thus vegetarian, this way nothing unholy could enter their homes. For some reason, the blue view is really captivating and it falls on our list of India's "must sees", no matter how loud, dirty and polluted the rest of the city is. The 40+ temperature of Jodhpur was a major shock to the system. 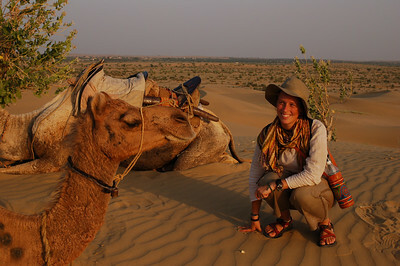 The heat of mid-day proved unbearable for me, and I spent most of our time in Jodhpur sweating in our hotel room. At night, with absolutely no breeze and barely a temperature drop, we spent most of our time tossing and turning leaving giant puddles of sweat where we had previously lay. I even took to having cold showers in the middle of the night to cool myself down. Then, I started not being able to handle much food, Jodhpur would be the begining of a 10 day bread and water stint. In a strategic heat avoiding manoeuver we woke up for sunset to hike up to the Meharangarh Fort only to find that it only opened at 9 am. Considering by that time the morning cool is already distant, it frustrated us slightly. 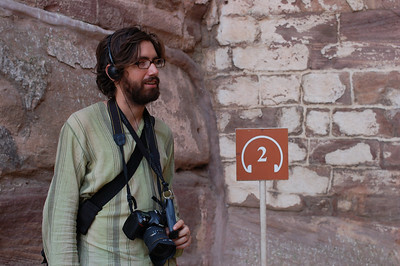 The fort is equipped with an audio tour guide which was actually a lovely treat. We were the first visitors of the day and we often arrived to find the guards neglecting their duty, including one who showed us his bag full of opium and took back his offer of sharing some when we looked surprised (we weren't offended, just genuinely surprised). Opium is actually extremely commonly used in Rajasthan, often taken to celebrate births, weddings or other celbrations (we learned this from our audioguides before encountering the guard). After three quasi-sleepness nights in Jodhpur we chose to head even further into the Thar Desert to the sandstone city of Jasailmer. 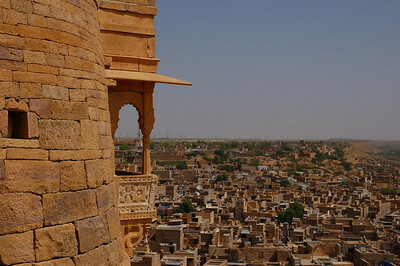 Jasailmer is much smaller than Jodhpur and really seems to sprout right out of the desert. 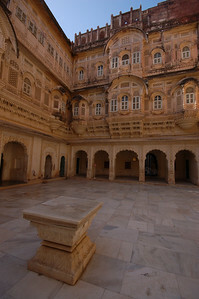 Its charm is inescapable, narrow alleyways and the beautiful golden sandstone Jasailmer Fort. A veritable sand castle! I pried myself from the bed/bathroom to visit the fort, but I remained on my bread and water diet. I attempted light Indian food one night, this resulted in the simultaneous blockage of two of three drains in the bathroom, not a pretty picture. I was completely exhausted, having lost almost 4kg in 2 weeks, but I was determined to have the full Jasailmer experience, this included a desert camel safari. We originally had planned an overnight in the desert, but with no signs of improvement on my part we opted for the "sunset package". This consists of a jeep ride to a small village 50km from Jasailmer, a two hour camel ride to the Khuri sand dunes to watch the sunset and back, dinner in the village and a jeep ride back to the hotel. When we arrived in Barna village to pick up our camels, it was after 4pm and Yann's thermometer read 44 C. The usual crowd of children greeted us, faces and hair completely encrusted in sand and full of energy despite the heat. We found our huge camels and young guides on the outskirts of the village ready for the trip. Camels are hilarious, gigantic beasts, their legs are so skinny you think they are going to snap at the joints. Mounting a camel is much easier than a horse, as they kneel down to the ground to let you on, its really amazing and watching Yann mount and dismount his camel was a hilarious ordeal! Our trip to the dune was peaceful (minus our guide impressing us with his knowledge of John Denver and Aqua tunes), we crossed a few shepherds, other than that we were completely alone. In the two our trip we saw peacocks, antelope, desert foxes, lizards and a hare and we sat on the dunes for the sunset, finally getting a reprieve from the heat. We arrived back at the village after what seemed like an eternity. Camels are no horses, they are excrutiatingly uncomfortable on the backside, and we were extremely grateful that we didn't have to get back on them again, although happy that we had given it a try. Cela doit etre assez fascinant de faire une randonnee en chameau. On doit se sentir tres haut. Avec cette chaleur que vous avez presentement, vous allez trouver confortable votre retour au pays avec des 30 degres....que nous avons durant l'ete. J'ai oublie de signer mon nom mais je crois que vous m'avez reconnu. 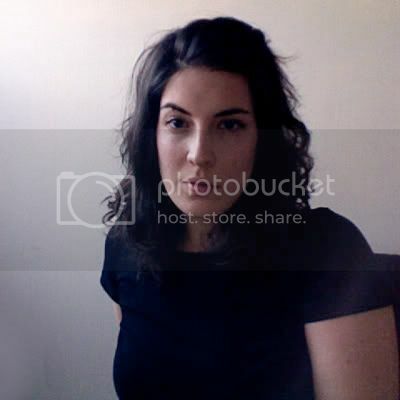 quelles belles photos! Je sais que ce bout de chemin a été difficile mais, de l'extérieur, cela en valait la peine. Vous êtes parmi les rares personnes qui pourront se vanter d'avoir vécu cette expérience. Les dromadaires sont vraiment beaux ainsi que les photos du désert, wow! That photo of the guard sporting the traditional Rajasthani facial hair. Oooeee that's a beauty. Could a photo be more RICH in colour? That's a National Geographic cover if I've ever seen one.